Located in the heart of charming SoHo, XOCO 325 is a LEED certified condominium building that features 21 units throughout its 10 stories. 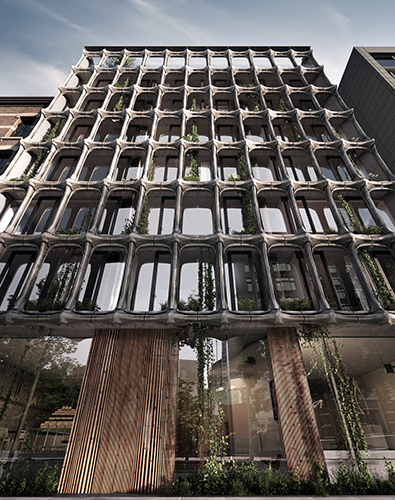 With a striking façade comprised of cast-aluminum and vertical gardens draped over a glass curtain wall, XOCO 325 celebrates SoHo's cast-iron history in a contemporary way. XOCO 325, named after the Catalan word for chocolate, pays homage to the building's past life as a tootsie roll factory. Residents will enjoy beautifully outfitted interiors as well as a fitness studio overlooking a private garden, private storage, and private bicycle storage. Due to the building's location within a historic district, we worked with the NYC City Planning Commission & Landmarks Preservation Commission to secure design approval. For our clients at DDG Partners.